On Wednesday, April 17, 2019 five new enhancements were launched in ICOTS. This is the second of several enhancement releases to take place during FY 2019. 1.) Allow State Administrators to Edit Compact Office Information - Previously the only way for a compact office to change the contact information for their office, their state designee, compact office email, or public web portal information was to submit a request to the national office. This enhancement allows users with the State Administrator role to update all of the aforementioned contact information. From the Administrators tab, state admins can now select "Edit Compact Office" from the available sub-tabs. Their compact office will show up on the page, with an 'Edit' button on the right-hand side. 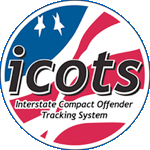 The "ICOTS System Information" section contains fields for the office address & phone, the compact office designee, and compact office email. The compact office designee is the name of the user that is displayed at the bottom of every compact activity PDF in ICOTS for your state. The compact office email is the address to which all compact office notifications are sent. This can be a single user, like the compact office designee, or it can be a generic email address that goes to multiple people in your compact office. The "ICOTS Public Web Portal Information" section contains all the information displayed on the search results for the ICOTS PWP. This information is displayed directly to the public and can be accessed by anyone with web access. Compact Offices can also opt in or out of the public web portal at the bottom of this section. 2.) Allow Supervisor to Inherit Direct Reports - The previous method for reassigning multiple POs from one supervisor to another involved going into each POs account profile and updating their supervisor manually. This was slow and cumbersome in the instance when multiple POs need reassigning to another supervisor. This enhancement adds a new "Direct Reports" sections to both the "Users" tab and "Edit User Account" profile. Under the "Users" tab, Direct Reports shows all the POs currently reporting to the logged in supervisor, along with the PO's account status. Compact Office staff can use the "Edit User Account" sub-tab under "Administrators" to reassign one or more POs from the selected supervisor to another ICOTS user with the supervisor role in their state. The "Direct Reports" section of the user profile is shown for all users with the supervisor role. This sub-tab allows a compact office user to reassign some or all POs reporting to a supervisor to another supervisor listed in the drop down field for "Transfer To:". 3.) Generate Case Note on Compact Activity Reassignment - Previously, only case reassignments were captured in the activity history. Now, when an individual compact activity is reassigned from one user to another using Manage Case Load (outside the normal compact workload), a case note is generated for that activity. This will greatly reduce the confusion in states that incorporate reassigning individual compact activities with Manage Case Load as part of their normal business practices. 4.) Add Submit Button to Top of Manage Case Load Screen - Previously, the only method to finalize the reassignment of a case or compact activity was to scroll all the way down to the bottom of the screen and click the Submit button. That could be cumbersome if there were a lot of records and the user only needed to reassign a couple items at the top of the page. This enhancement adds another Submit button to the very top of the case list on the Manage Case Load screen. It should streamline the reassignment process for supervisors and compact office users that utilize Manage Case Load on a regular basis. 5.) Add Offender's Date of Birth and State IDs in Manage Case Load Screen - Two new identifying columns have been added to the case list in Manage Case Load, date of birth and state ID. These additional fields will assist compact offices and supervisors in making sure they identify the correct offender and case prior to reassignment.